I don’t know who is and why they are doing this. Potti also said that the online reputation manager service that he reportedly hired was actually the effort of one such well-wisher. That service was terminated last year at his request, he said, and the people who hired them did not know anything about the takedown notices either. As Retraction Watch readers can understand, we wanted some proof that this was actually Potti emailing us. While there’s really no way to be 100% sure, he did send us, at our request, material to which only Potti would have access. We of course have lots more questions for Potti, and he said he hoped to be able to discuss the case further at some point. For now, he said, he has been advised to wait until malpractice lawsuits pending against him are resolved. There is a good discusson of the concept of “Occam’s Razor” in the Wikipedia entry of the same title. http://en.wikipedia.org/wiki/Occam's_razor. While the article above provides additional information regarding the Anil Potti case, I believe it matters little if Anil Potti or one of his supporters are utilizing the services of a reputation manager. The apparent desired result is that derogatory information regarding the conduct of Anil Potti, M.D. has a lower probability of being retrieved in a computer-based search. Absent meaningful sanctions (and the exploitation of loopholes), it is likely that more of this kind of conduct will be observed in the United States. I believe this would be an undesired outcome. Anil Potti is claiming the reverse Streisand effect (blocking sites with the intention of increasing news coverage) which is bizarre – but, it must be said, plausible. The Streisand effect has become universal enough that even lawyers are (often) aware of it. Who hired the reputation manager matters little, but only in the face of what a reputation manager is supposed to achieve. However the result itself in this case may not be so clear-cut. We know a reputation manager was hired. Occam’s Razor pretty much said Potti did that himself, for want of any explanation why anyone else would do that for him (cui bono?). That is in itself a damaging (or is that damning?) piece of information, and could somewhat impede the achievement of the original goal. With which I don’t mean to say that people will be deterred from using rep managers. So yes it still will be an undesired outcome if more people start using them. And the fact he says he did not do it proves what, exactly? It prove absolutely nothing. But he has to disclaim responsibility because the punishment for filing a false DMCA take down notice is rather draconian in and of itself. So allegedly claiming that he had nothing to do with it is just a bunch CYA in an attempt to keep himself out of major legal trouble. So, how do we find out who filed the false DMCA? There has to be a way, and I bet it would lead to more fraudsters, if it does not go back to Potti. The problem one would face is that someone spent some time planning this scheme out and then implementing the plan they devised. I would assume that whomever filed the false DMCA claim knew full well what the penalties were/are for doing so and took every precaution to obscure their true identities. At this point it would probably take too much time, money and effort to back track who filed the false DMCA claim and so probably won’t happen. There was a recent controversy when someone Anil Potti classified as a potential “well-wisher” abused the DMCA process to temporarily have some news articles about him at the Retraction Watch website taken down. 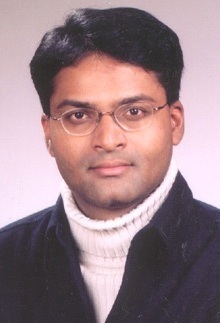 Eventually, Anil contacted Retraction Watch and claimed that a well-wisher had previously been utilizing the services of a “reputation manager” to present Potti in a more positive light. Someone else, apparently not the same “well-wisher,” according to Potti, had used a short-lived site based in India (which is also Anil Potti’s nation of origin) to abuse the DMCA process. Given those claims, I wonder how Anil Potti will explain away this site dated 08 March 2013 titled, “Anil Potti, the Famous Doctor” anilpotti12.wordpress.com/…. Or is the website the product of an inflated ego? Today, I archived a PDF of the website. The only thing missing is the stock photographs that accompany this blog design template. I don’t suppose he will explain it. On the site are 4 posts. Two are short biographies of Potti that have probably have been on the web before or are easily constructed from the CVs that take 5 minutes to find thanks to Cancer Letter. Plugging one of these biographies into google seems to suggest that someone has been spamming the net with this biography. The other 2 posts on lung cancer are straight out cut and pastes from the net. While the source material *could* be obtained via a web search, I believe that titling this page, “Anil Potti, The Famous Doctor” is consistent with a “reputation manager” still attempting to decrease the probability of say, a new patient finding the information about Potti’s cancer research frauds. I note the 08 March 2013 biography on this page references Potti’s oncogenomics research. Running a Google search on the phrase “Anil Potti, The Famous Doctor” yielded about 604 results at 11:45 PM PDT on 10 March 2013. I believe that such a large number of results for this unique self-promoting phrase is consistent with the services of a reputation manager still being employed.